Taoiseach Leo Varadkar (left), who is on an official visit to the United States, is accompanied by his partner Matt Barrett (right) as he stands in a group photograph with the US Vice President Mike Pence (second right) and the VP’s sister Anne Pence Poynter at the VP’s official residence in Washington DC. Leo Varadkar and Donald Trump yesterday clashed on Brexit, with the US president railing against the EU in a slap-down of the Taoiseach’s remarks on a proposed free trade deal with America. Mr Trump also used Mr Varadkar’s visit to the White House yesterday to warn Ireland and the EU the US is “going to tariff a lot of their products coming in because the European Union treats us very, very unfairly”. 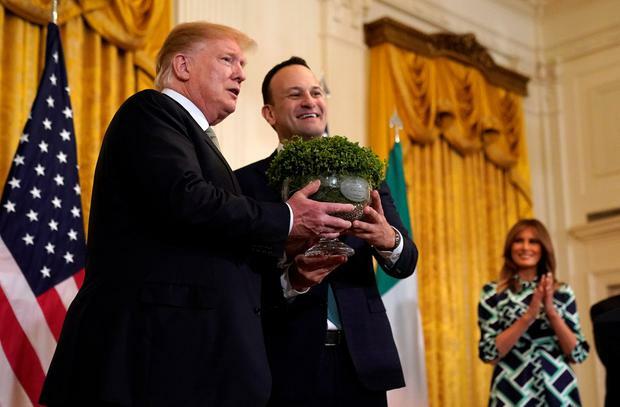 Meanwhile, at the traditional St Patrick’s Day shamrock ceremony at the White House, Mr Varadkar praised Mr Trump for the results of his efforts to ‘Make America Great Again’. In his speech, Mr Varadkar said: “Your ambition is to ‘Make America Great Again’, and I think we can already see some of the results of that. Earlier, at a somewhat chaotic Oval Office press conference with the Taoiseach, Mr Trump took the opportunity to criticise British Prime Minister Theresa May’s handling of the UK’s departure from the EU. Mr Trump said he intends to visit Ireland this year and renewed his pledge to build a border wall with Mexico. Bilateral relations and the Irish undocumented immigrants in the US were on the agenda for Mr Varadkar’s Oval Office meeting with Mr Trump, but Brexit dominated their talks. Before Mr Varadkar’s arrival, Mr Trump tweeted that he looked forward to making a trade deal with the UK, several hours before British MPs in the House of Commons were due to vote on whether they should seek an extension for Brexit from the EU. Sitting beside Mr Varadkar, Mr Trump claimed the process of trying to reach a trade deal between the US and the EU contained difficulties. He added: “I hate to see everything being ripped apart right now,” and said he didn’t think a second referendum would be possible. Mr Trump said the “issue on the Border of Ireland is one of the most complex points”. He said it was the UK’s decision and the most important thing for Ireland was to avoid a hard Border and protect the peace process. Mr Varadkar also said Ireland wanted frictionless trade with the UK and he believed in free trade, and while it may be years before the UK “sorted itself out”, the EU was “available to talk trade with the US”. After their private meeting, Mr Varadkar said it had been an opportunity for him to set out Ireland’s position on Brexit, “particularly when it comes to the peace process”. He said: “I know he is a supporter of Brexit and I am not.